It’s the most wonderful time of the year. Until you realize that you are hosting 25 people and don’t have enough chairs. We all know that the holiday season can leave you feeling like yours hanging upside down, with all the blood rushing to your head. Here are some of my tips to make the weeks before Thanksgiving and leading up to Christmas a little easier! Vacuuming and dusting is a given, but I’m talking about serious clutter removal. Every year around this time we all slowly start acquiring new items; big or small, it’s a good time to go through your things, identify what you really aren’t using and donate them to someone less fortunate. This year, I’ve started with my daughters books and toys. She’s learned the word “pick” and the meaning of it, so she and I are going through and picking toys that she wants to hug and toys that she doesn’t. It’s a good habit to start and really makes me reflect on how grateful I am for the blessings of this life. This may seem like a no-brainer, but from what I’ve heard it’s not a given. I get more excited about giving than receiving so it’s easy for me to go overboard. My husband and I sat down a few days before Halloween and set a budget for gift-buying. I independently set one for entertaining and food purchases during the season as that can be a cost that we forget! This is one that I’m really excited about this year. Blending family traditions can be challenging; the reality is that we all have great memories of Thanksgiving and Christmas traditions and all want to replicate those in our adult life. Sometimes, without bad intentions, it can become a contest of whose childhood tradition is better. I’ve been married almost four years now, and my advice to anyone struggling here: Set aside your compromising and be creative. Start new traditions for your family and make new memories. It doesn’t erase the old ones, but can remove the stress of “choosing” who’s Christmas eve tradition you want to go with. 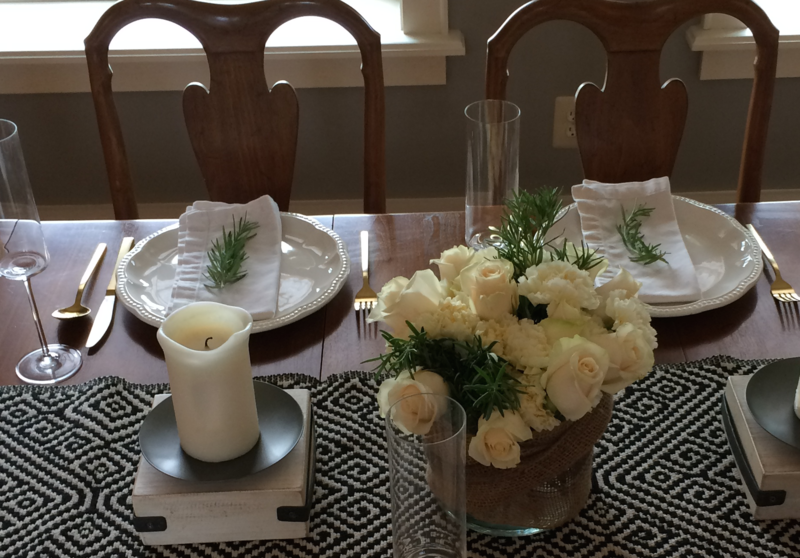 This time of year is great because the table setting features can last quite a while. Greenery and gourds can easily be put on your table three or four days early and still look fresh for the holiday meal. Do yourself and everyone else a favor and get as much done ahead of time as possible. Setting the table is one of those things. Sometimes, just being thoughtful, can save a lot of money and seem like you went above and beyond. If you have a fresh herb garden, use some twine and tie the rosemary or sage leaf to the napkin at your place setting. It’s earth-friendly (after use, dry them and store for cooking) and charming. Whether it’s an ice-breaking table game or Bagg-o in the back yard, have something for guests to do. It will keep people entertained when you need to run in and out of the kitchen and when you’re ready for a break, provide you with some fun! This goes with doing as much ahead of time as possible.Try on your outfit and accessorize. If you know what you’re going to wear when guests arrive, you can run around in sweats all morning and do a fifteen minute costume change. It eliminates stress for you and cuts time in the long run. I have had far too many dinner parties that I wear a big sweater and I’m sweating my makeup off an hour into entertaining. Thanksgiving is like a dinner party on steroids, so do yourself a favor and dress accordingly. You’ll be inside a heated house, with an oven running and more people than are usually there. This equals warm. The beauty of fall is that layering is an option. Wear a sleeveless shell and a great leather jacket and scarf that can be thrown on if you want to run outside for a game. I am fortunate enough to have a very helpful family and friends that are like family; I’m still bad at this one, so this is a reminder for myself too. When they offer to help. Don’t deny it. You’ll be exhausted and they want to contribute. Cleaning up and laughing in the kitchen at the end of the evening can also be a refreshingly wonderful moment. Previous Who doesn’t love a Santa shaped chocolate bar?